Why is water increasingly becoming a non- renewable resource in many areas? There is no doubt that global warming is going to change the pattern of water availability throughout the World. Some areas will get more rainfall, in some instances significantly higher amounts, or the same as before but as fewer and more intense rainfall events. In contrast, other areas will get less rainfall leading to severe and possibly permanent drought, a scenario currently playing out in Australia and some parts of central Africa. 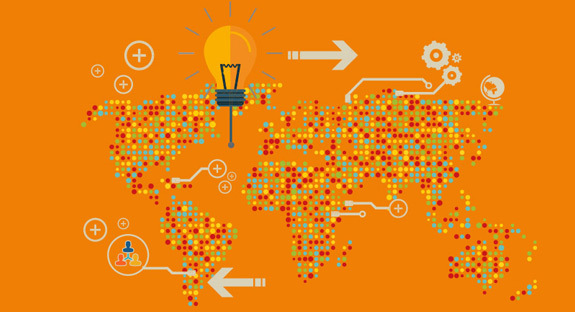 It remains difficult to be precise at this stage how it will affect specific areas and there will be local variations arising from more regional trends. Global warming will also lead to increased evaporation and plant evapo-transpiration creating more water movement between the land and the atmosphere as well as melting snow and glaciers releasing more freshwater. In terms of water resources there will be a continued increase in the loss of snow and ice which are often used as an important water supply resource. Less precipitation will lead to less surface water and less aquifer recharge, with less aquifer recharge resulting in a gradual reduction in both ground and possible surface water availability. Intense rainfall events will lead to greater loss of water as surface runoff, leading also to flooding and poorer water quality as we saw in the UK and much of Western Europe between December 2013 to February 2014. Overall demand for water will be driven by the expected increase in temperature, although resources will have been compromised by the more erratic climate. The current trend in increase demand due to urbanization and migration will continue as more people migrate to cities, and there will be an increased water demand for irrigation and livestock. Overall less water results in poorer hygiene and greater risks of disease and disease transfer. In areas where precipitation increases sufficiently, net water supplies may not be affected or they may even increase; however, where precipitation remains the same or decreases, net water supplies will decrease overall. Peak water is reached when the rate of water demand exceeds the rate at which water resources used for supply can be replenished. Therefore, all water supplies can be considered finite as they can all be depleted by over exploitation. So while the total volume of water in the hydrological cycle remains the same, the availability of water does alter. This is particularly true of aquifers (groundwater) and static water bodies such as lakes and reservoirs where the water may take a long time to replenish. So water availability is strongly linked to rainfall and the ability to retain this water within resources becomes incrementally more difficult as increasing intensity of precipitation reduces infiltration. Due to increasing demand from population growth, migration to urban centres and for agriculture, it is possible that a state of peak water could be reached in many areas if present trends continue. By 2025 it is estimated that 1.8 billion people will be living with absolute water scarcity and in excess of 4 billion of the world’s population may be subject to water stress. Peak water is not about running out of fresh water, but the peaking and subsequent decline of the production rate of supplied water. A question I am often asked is how does a renewable resource become finite? The answer is not as straight forward as first appears. Water availability is governed by a number of possible factors: Over-abstraction (i.e. using it before it can be replenish thereby exhausting the supply and causing significant and often permanent ecological damage), not returning water to hydrological resources, saltwater intrusion often caused by over-abstraction, pollution of resources and finally climate change effects (glacier loss, reduced stream flow, evaporation of lakes). Comparatively only a very small amount of water is regularly renewed by rain and snowfall, resulting in only a small volume of water available on a sustainable basis. So all water supplies have an optimal abstraction rate to ensure they are sustainable, but once exceeded then supplies are doomed to failure. The Hubbert curve applies to any resource that can be harvested faster than it can be replaced (Figure 1). This applies to all water resources but especially to groundwaters. Peak Renewable Water comes from resources that are quickly replenished such as rivers and streams, shallow aquifers that recharge relatively quickly and rainwater systems. These resources are constantly renewed by rainfall or snow melt; however this does not mean these resources can provide unlimited supplies of water. If demand exceeds 100% of the renewable supply then the “peak renewable” limit is reached. For many major river catchments globally, the peak renewable water limit has already been reached. For example, in excess of 100% of the average flow of the Colorado River is already allocated through legal agreements with the seven US States and Mexico. So in a typical year the river flow can now theoretically fall to zero before it reaches the sea. Similarly the River Thames can during periods of low flow fall below the volume of water abstracted. The river is prevented from drying up due to over-abstraction by returning wastewater after treatment to the river which is then reused numerous times as it approaches London. Due to the high population within the catchment, the Environment Agency has classified the area as seriously water stressed with towns and cities along the length of the Thames such as Swindon, Oxford and London itself, at risk of water shortages and restrictions during periods of dry weather. Peak Non-renewable Water comes from resources that are effectively non-renewable aquifers that have very slow recharge rates , or contain ancient water that was captured and stored hundreds or thousands of years ago and is no longer being recharged (a problem that will be exacerbated by climate change), or groundwater systems that have been damaged by compaction or other physical changes. Abstraction in excess of natural recharge rates becomes increasingly difficult and expensive as the water table drops which results in a peak of production, followed by diminishing abstraction rates and accompanied by a rapid decline in quality as deeper more mineralized waters (i.e. increasingly salty to the taste) are accessed. Worldwide, a significant fraction of current agricultural production depends on non-renewable groundwater (e.g. North China plains, India, Ogallala Aquifer in the Great Plains of the United States) and the loss of these through over-exploitation threatens the reliability of long-term food supplies in these regions. When the use of water from a groundwater aquifer far exceeds natural recharge rates, this stock of groundwater will be depleted or fall to a level where the cost of extraction exceeds the value of the water when used, very much like oil fields. The problem is that climate change often results in less rainfall creating a greater dependence on aquifers for supply. Peak Ecological Water is water abstracted for human use which leads to ecological damage greater than the value of the water to humans. The human population already uses almost 50% of all renewable and accessible freshwater leading to serious ecological effects to both freshwater resources and transitional habitats such as wetlands. Since 1900, half of the world’s wetlands have disappeared while approximately 50% of freshwater species have become extinct since 1970, faster than the decline of species either on land or in the sea. Water supports both man’s need and that of its natural flora and fauna. These fragile environments need to be preserved for overall planet health. The simple fact that water supply quality is closely linked to ecosystem processes and health, with most water bodies able to self-purify its water constantly removing pollutants and improving quality overall. However, the problem has been in putting an economic value on ecological systems (sometimes referred to as ecological services) and nature as a whole; whereas water used by humans can be easily quantified economically. In the mistaken assumption that such values are zero has led to them being highly discounted, underappreciated, or ignored in water policy decisions in many areas. Over-abstraction is a major problem in many rivers in southern England that are fed from the aquifer below; so as more groundwater is abstracted then the water table falls causing the water level in the river to also fall and even dissapear. It is not only rivers that are drying up due to over abstraction and global warming but some of the largest freshwater lakes in the world such as the Aryl Sea and Lakes Chad and Victoria in Africa (Figure 2). Figure 2. 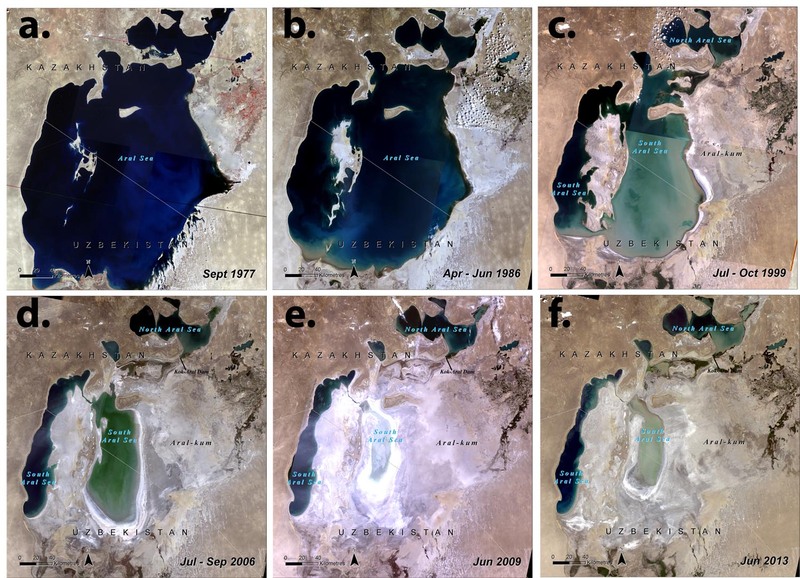 The rapidly shrinking Aryl Sea in time sequence starting Sept 1977 (a) to June 2013 (f). In the USA, water abstraction and water use peaked during 1975 to 1980 but has stabilized since (Figure 3). This should have affected economic growth but it has been able to continue to grow by implementing better water management strategies to satisfy the new needs of industry. This has been achieved through water conservation, stricter regulations, water efficient and improved technology, education, water pricing etc. 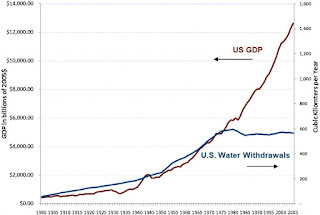 So US citizens are now using less water per capita than ever before. 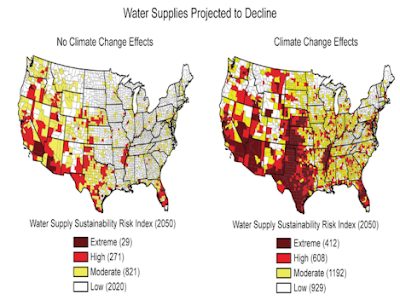 However, many regions of the U.S. face water scarcity (e.g. the arid west) and new areas of water scarcity continue to develop due to climate change (e.g. southeast and Great Lakes region) which all indicate that peak water has been reached (Figure 4). The key question is how long can economic growth be sustained without water becoming a limiting factor? Figure 4. Water supply sustainability index predicted for 20050. Will water shortages affect us in Ireland and the UK? The straight answer is yes, and to some extent already is. No one is exempt from the peak water crisis. Due to global warming most arid regions will probably run out of water in less than two decades. In wetter areas, peak water has been reached due to: heavy use of water; pollution of resources (often associated with urbanization); infrastructure not being completed to keep up with demand (China, India) and finally inadequate infrastructure (London, Dublin). Agriculture, industrialization and urbanization all serve to increase water consumption. Agriculture represents at least 70% of freshwater use worldwide and with the demand for food soaring, especially as a result of climate change and increasing crop failure (e.g. China rice failure in 2011), then demand for irrigation and livestock watering will continue to be a major drain on supplies. Over-abstraction causes severe ecological damage as lakes dry up and rivers fed by groundwater disappear; a rapid reduction in water quality of groundwater due to mineralization and saltwater intrusion and increased exposure to pollution and pathogens. There are alternative methods of supplying water (i.e. supply-side management solutions) such as river transfer where water is pumped from one catchment to another using natural river systems, extended pipelines carrying water from areas of low demand to areas of high demand, international bulk water transfer using land and ocean going tankers which is already used to supply islands such as Gibraltar; desalination which is creating freshwater from sea water and even fog harvesting collecting water from sea mists and fog using fine nets.But supply-side management option are high energy solutions, so we have to also look seriously at demand-side management as the first and prefeered option for the development of sustainable water supplies. Gray, N.F. (2015) Facing up to Global Warming: What is Going on and How You Can Make a Difference. Springer International Publishing, Switzerland. 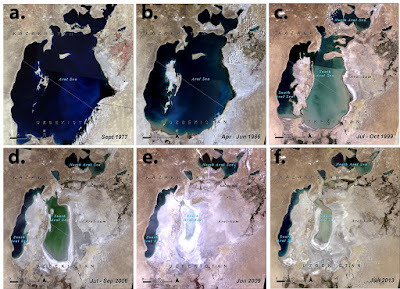 Fig 2 The Aryl Sea was once a massive freshwater lake but is now rapidly shrinking due to excessive abstraction from the rivers that flow into it. The letters a to b show the time sequence of area since September, 1977 to June, 2013. As abstraction has continued the lake has become increasingly polluted, nutrient enriched and mineralized causing extensive ecological damage. This has happened since the mid 1970’s! Source: UNEP http://na.unep.net/geas/getUNEPPageWithArticleIDScript.php?article_id=108 Reproduced with permission of the United Nations Environment Programme, Nairobi, Kenya. 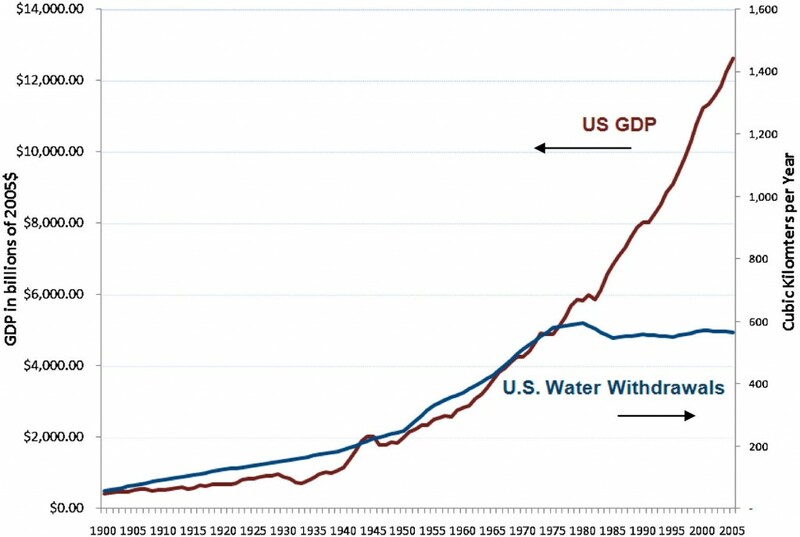 Fig 3 Peak water in the USA has been reached, but continued economic growth has continued by implementing a water demand management approach to the available water supply which is now at peak. Reproduced with permission of the National Academy of Sciences, Washington D.C., USA. 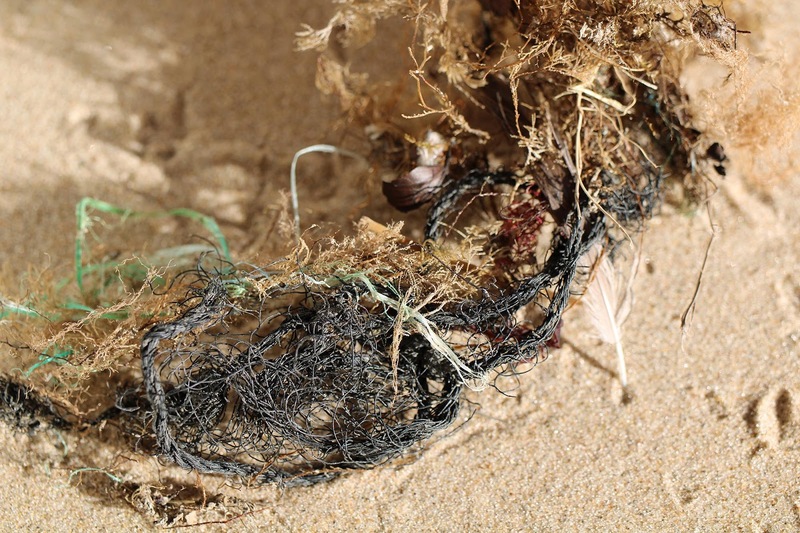 We associate beach litter with large items such as plastic bottles, plastic bags and sheeting netting, but emphasis has been placed on other categories of plastic waste such as nurdles (https://www.nurdlehunt.org.uk/whats-the-problem.html) and micro-plastics. 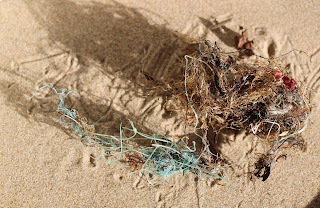 However, the other day while walking along the lovely beach at Brittas Bay in County Wicklow (Ireland) I was pleased to see that there was no large litter to be seen along its 2 km length. 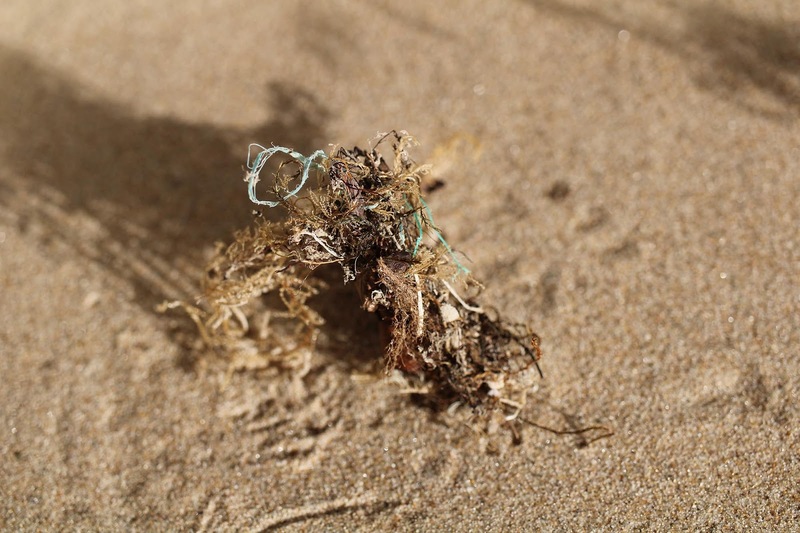 There were a few small plastic strips okay but the beach looked lovely and clean. I even checked for nurdles…nothing…wonderful. material, which looked lovely and natural. 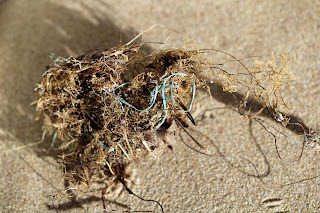 So I thought I would take a photograph and to my surprise something coloured took my attention inside the small bundle. 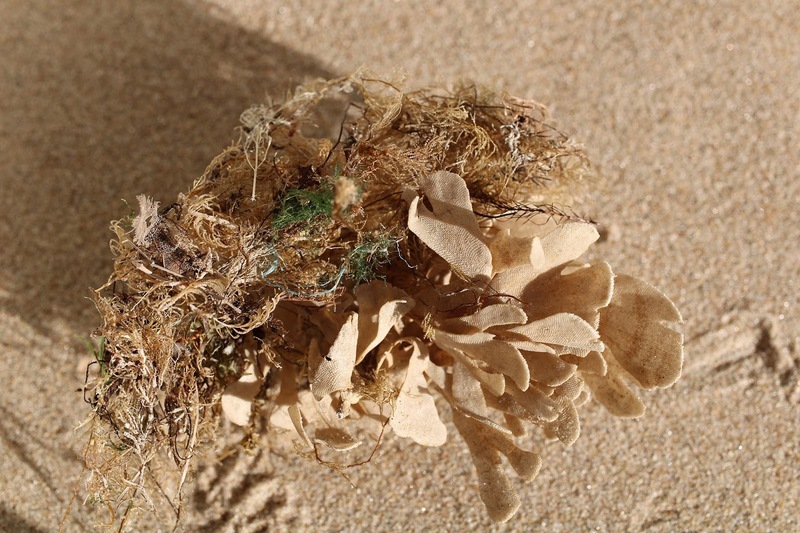 The upshot of this revelation was that each one of these lovely little bundles of natural material was held together by plastic filaments. 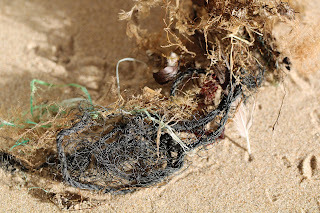 Usually single blue strands, some with strands of transparent mono-filament net, others contained more obvious black netting. There were thousands of these little bundles all along the intertidal zone. I was totally astonished and unaware of the effect these small plastic fragments were having and the possible consequences for the marine food chain. It would seem that we have yet another category of marine plastic pollution. On average travel represents a staggering 56% of our primary (personal) footprint in Ireland. Car ownership is rapidly increasing throughout the EU reaching an estimated 252 million in 2015/6. 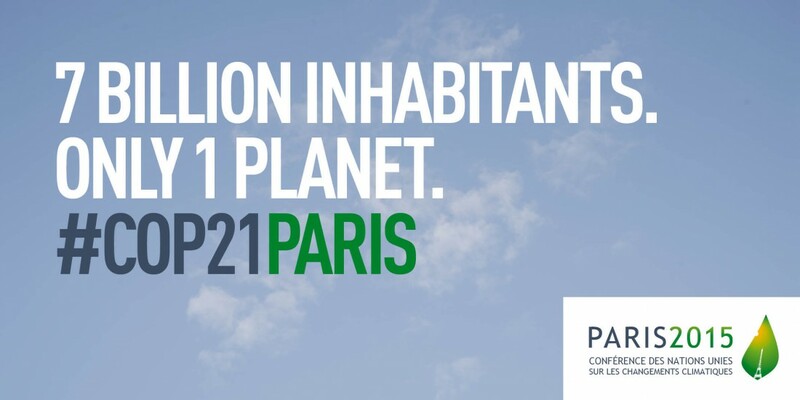 This is equivalent of 600 million tonnes of CO2 e being emitted by European drivers each year, which is only a small portion of the 1.8 billion cars worldwide. Manufacture’s fuel efficiency data and fuel types are discussed explaining the difference between real and lab based emission values. Comparison with other transport modes are made using carpooling as an example of how drivers can make car usage more efficient than public transport where it is limited or not available. 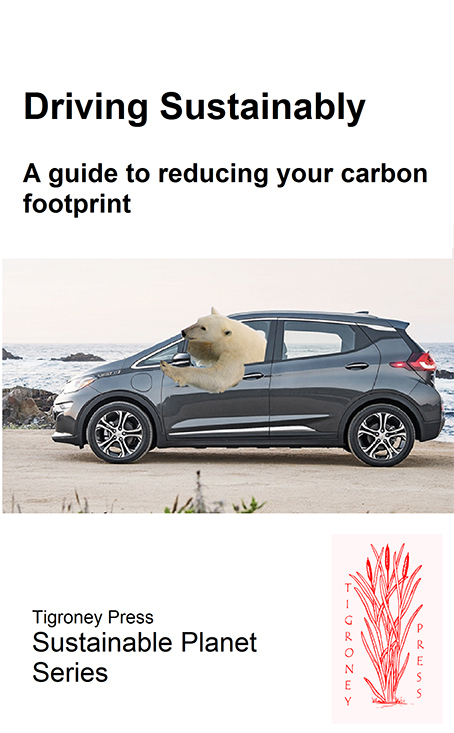 The booklet explains practical ways in which we can all drive more sustainably as well as exploring the problem of emissions arising from the manufacture and disposal of vehicle which is currently ignored in our footprint analysis. Buying a car is discussed and studies have shown that you don’t need to buy a new electric vehicle (EV) or hybrid to drive with minimum impact. Emissions from EVs are compared to standard fuels indicating that the selection of the most appropriate vehicle type can save you a lot of money over the lifetime of the vehicle, and that EVs and Hybrids are not always a good choice for drivers with selection dependent on length and frequency of journey, whether urban or rural, or used for commuting. Driving sustainably results in drivers reducing their fuel consumption by 10-50% saving without actually driving less distance of using the car less frequently. This represents significant financial savings as well as reducing emissions, pollution and increasing driver safety. 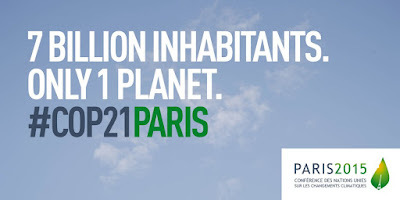 This means that an easily achieved 10% reduction in fuel consumption which all drivers can achieve, without reducing the frequency or distance driven, would save 10 million tonnes of CO2e within the EU each year, equivalent to 7.9 million tonnes in the UK or 0.42 million tonnes of CO2e in Ireland where car ownership is around 2,000,000. So for every 10% reduction in fuel usage each car would on average be saving 0.234 or 0.213 tonnes of CO2e per annum in the UK and Ireland respectively from their primary footprint. With a 20-30% reduction possible for the average driver then driving sustainably can make a significant different to greenhouse gas emissions responsible for climate change as well as making our air cleaner and driving safer. A new imaging technique, developed by a team led by Dr Magnus Gålfalk at the Linköping University in Sweden and described in Nature Climate Change, allows us to see for the first time where it is being generated. The video shows methane emissions (shown in purple and green) escaping from a vent in barn of housing 18 cows. This is a major step forward in our management of greenhouse gas emissions from landfill, agriculture, wastewater treatment and any other potential source of the gas. Our book Facing up to Global Warming: What is Going on and How You Can Make a Difference? published by Springer and launched for COP21 by Professor Nick Gray of the Trinity Centre for the Environment explores what global warming is, how it affects climate and importantly how we can deal with. It is a challenge that everyone needs to be a part of. So on this day of action make a pledge to do your part to reduce greenhouse gas emissions by examining how you can minimize waste without compromising how you want to live.